Though coffee arrived in Peru relatively early—in the middle of the 1700s—it wasn’t cultivated for commercial export until nearly the 20th century, with increased demand from Europe and the significant decrease in coffee production in Indonesia. 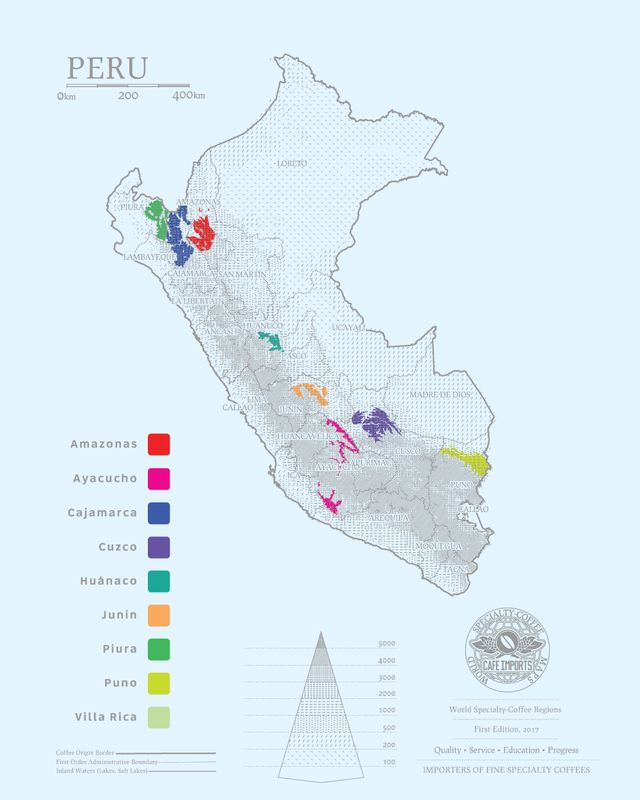 British presence and influence in the country in particular helped increase and drive exports: In the early 1900s, the British government took ownership of roughly 2 million hectares of land from the Peruvian government as payment on a defaulted loan, and much of that land became British-owned coffee plantations. As in many Central and South American countries, as the large European-owned landholdings were sold or redistributed throughout the 20th century, the farms became smaller and more fragmented, offering independence to farmers but also limiting their access to resources and a larger commercial market. Unlike many other countries whose coffee economy is dominated by smallholders, however, Peru lacks the organization or infrastructure to provide economic or technical support to farmers—a hole that outside organizations and certifications have sought to fill. The country has a remarkable number of certified-organic coffees, as well as Fair Trade–, Rainforest Alliance–, and UTZ-certified coffees. Around 30 percent of the country’s smallholders are members of democratic co-ops, which has increased the visibility of coffees from the area, but has done little to bring incredibly high-quality lots into the spotlight. As of the 2010s, Peru is one of the top producers of Arabica coffee, often ranked fifth in world production and export of Arabica. The remoteness of the coffee farms and the incredibly small size of the average farm has prevented much of the single-farm differentiation that has allowed for microlot development and marketing in other growing regions, but as with everything else in specialty coffee, this is changing quickly as well. The country’s lush highlands and good heirloom varieties offer the potential for growers to beat the obstacles of limited infrastructure and market access, and as production increases, we are more likely to see those types of advancements. For many years, Café Imports has partnered with CENFROCAFE, one of the largest and possibly best-organized cooperatives in Latin America, for the bulk of our Peru lots. Despite the overall lack of a cohesive national coffee institute or NGO, CENFROCAFE has been able to support nearly 2,000 coffee-growing families by offering agricultural and financial resources, as well as encouraging producers to learn to roast and to gain exposure to specialty coffee. In addition to the full-container certified and noncertified lots we buy from CENFROCAFE, we are also exploring Regional Select coffees and microlots, specifically from Cajamarca in the northwest, which is not only where the bulk of the country’s coffees come from, but also far and away the best-cupping lots. A small group of producers there have been developing microlot-quality coffees for several years, and we are excited to continue to nurture those relationships as well as to see what is possible from some of the individual members of the cooperatives. Historically, Peru’s mild cup profile and relatively inexpensive price have made the coffees an appealing blend component, especially as a seasonal replacement for Mexican coffees. We have high hopes that with more interest from coffee buyers and quality development along the supply chain, we will see more and more finest-quality coffees out of Peru, and lots that will become single-origin offerings to be reckoned with.